I KNOW WHITE DENIM isn't everyone's cup of tea however, when Spring rolls around and the flowers are in bloom, fresh white denim gives every outfit a lift. White literally goes with everything. The trick with white denim is to get the fit right, too tight and the Australian Ballet will be calling, too loose and it's the Navy giving you a bell. As it's still quite mild, I've paired together a light weight silver grey merino wool turtleneck and dark green deconstructed washable wool blazer for ease of movement and warmth. The accessories are casual but tie in with these Spring tones nicely. 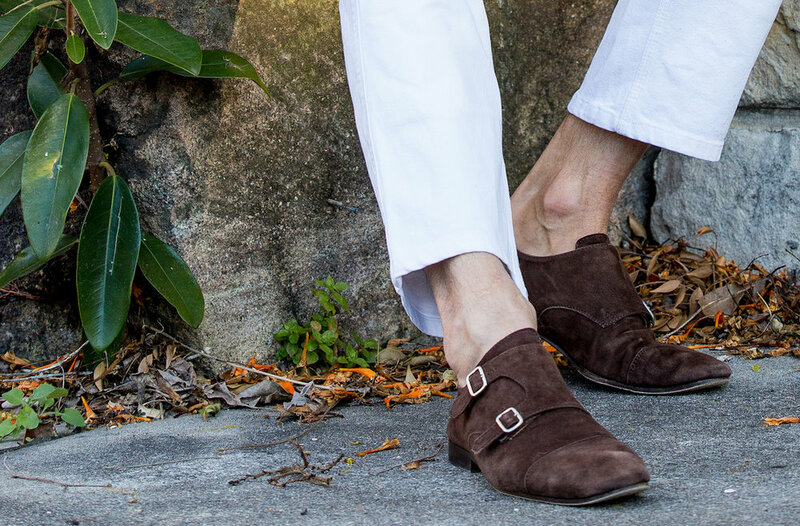 Brown suede double monk strap shoes (crazy comfy, even sans socks) is reaching the outer limits of darkness to pair with these Acne white denim jeans. Tan, grey or navy shoes would work just as well. The lapel detail is actually two silk knots (used as cufflinks) for a change. Sunglasses start to get a workout as the weather warms up and the light gets brighter. Try this ensemble for a weekend lunch date or casual Friday. If the green is pushing it, throw a navy blazer on instead.